The BUNN ST Velocity Brew 10-Cup Thermal Carafe Home Coffee Brewer is one of the fastest coffee makers on the market, needing only 4 minutes to brew an entire pot. It also uses a thermal carafe to keep coffee hot for hours and tasting just as good as it did when it was freshly brewed. The BUNN ST Velocity Brew is a very fast and efficient coffee maker the brews a delicious batch of fresh coffee every single time. It features a thermal carafe, so if you like your coffee to stay hot its perfect for you. 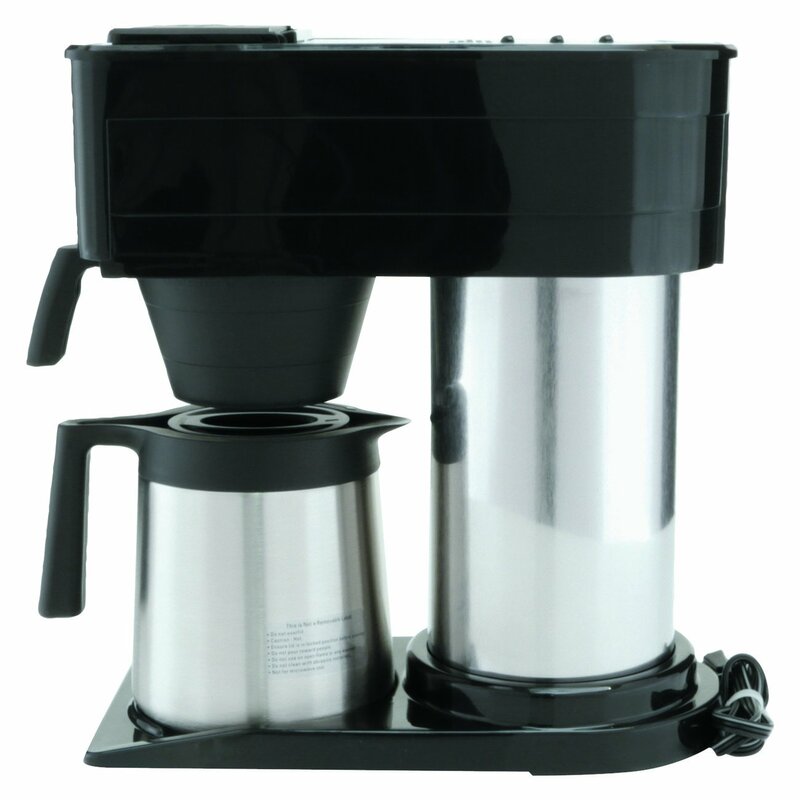 Moreover, it’s one of the fastest brewing machines on the market so ideal for inpatient coffee drinkers. One of the features that makes the BUNN ST Velocity Brew completely different from its competitors is the that interior water reservoir is kept boiling at all times. With the water already boiling, that is one thing less to do when it comes time to brew. The water is kept at 200 degrees F at all times because this is the ideal temperature for brewing coffee. At this temperature the most possible amount of flavor and aroma leaves the ground and infuses with the water. Thanks to this technology the BUNN ST Velocity Brew needs only 4 minutes to brew an entire batch, including drip time. A second unique feature of the BUNN ST Velocity Brew is it’s 10 cup thermal carafe. Many coffee makers still use the standard glass carafe and heater plate combination. Heater plate’s do keep coffee hot, but ruin the taste entirely, an hour later the coffee tastes “burned.” A thermal carafe solves this issue and that is why the BUNN ST Velocity Brew doesn’t even feature a heater plate. The thermal carafe is double walled and vacuum insulated and can keep your coffee hot for up to 12 hours. A thermal carafe is absolutely perfect for entertaining guests or those long mornings where you just want to drink one cup after the other. Have that second (or third) cup taste as good as the first! The coffee doesn’t just need to be hot, it also needs to taste good and that is why the BUNN ST Velocity Brew features a unique shower head design spray head. This design is excellent at ensuring that the entire ground is soaked evenly and long enough for the water to take on the full flavor and aroma. The entire design of the coffee maker was to ensure durability, all the fittings and fixtures are heavy duty. 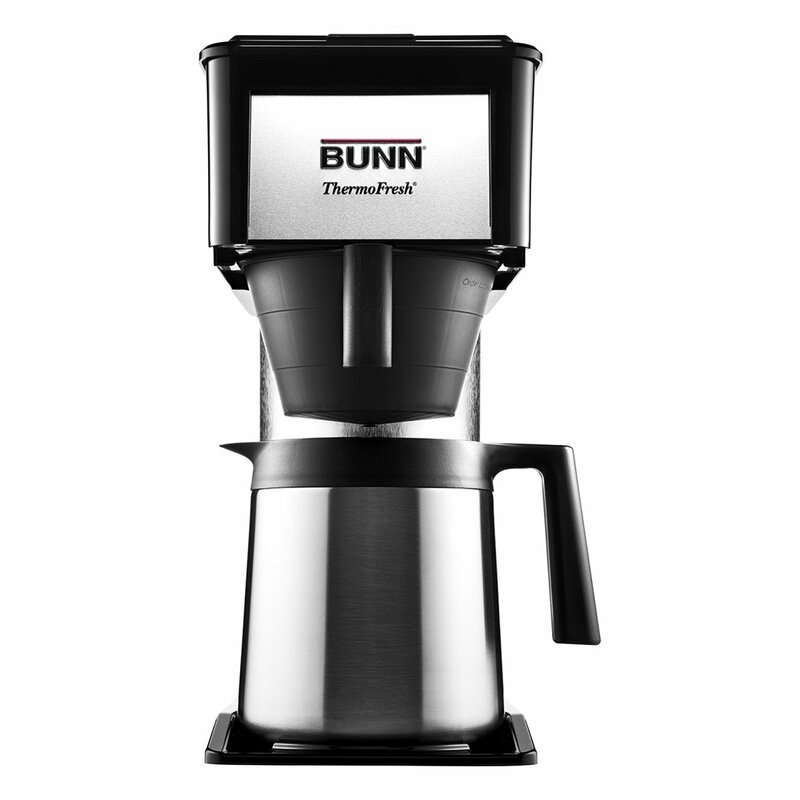 Moreover, the coffee maker has a 3 year warranty which shows the confidence BUNN has in this coffee maker. I can highly recommend the BUNN ST Velocity Brew, esspecially If you like coffee makers that feature thermal carafes. Thermal carafes are the better option and I don’t know anyone that wants a coffee maker that takes forever. It may not have an auto on function, but who needs that if it only takes 4 minutes to brew a pot. All in all a great choice from a company known for quality products and great customer service.